Borosilicate Glass Lens Wall Pack commercial lighting fixtures comes in 400 Watt MH wall-mounted unit providing illumination for safety and security around building perimeters and homeowners residence. These fixtures also provide broad distribution of light. Specs: Die Cast Aluminium Housing, Anodized High Purity Aluminum Reflector, Borosilicate Glass Lens, Wall Mounted, Quad V Volts, CWA Ballast, ED28/MOG Lamp Type, Lamp Included. 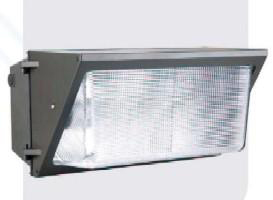 Cut Off 400watt HID Flood Lights DCMB1DN1. We recently upgraded our security lighting using Easy Rack w ..